Google has just released Latitude, a a service that lets you keep track of where your friends are by tracking the whereabouts of their mobile phones. 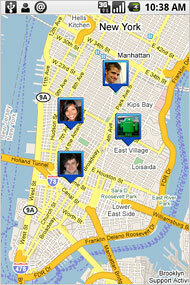 Android-powered devices with Maps v3.0 and above. G1 users in the US will be receiving Maps v3.0 in a system update soon. It is opt-in. Will Google be 'on top' of the privacy issue?